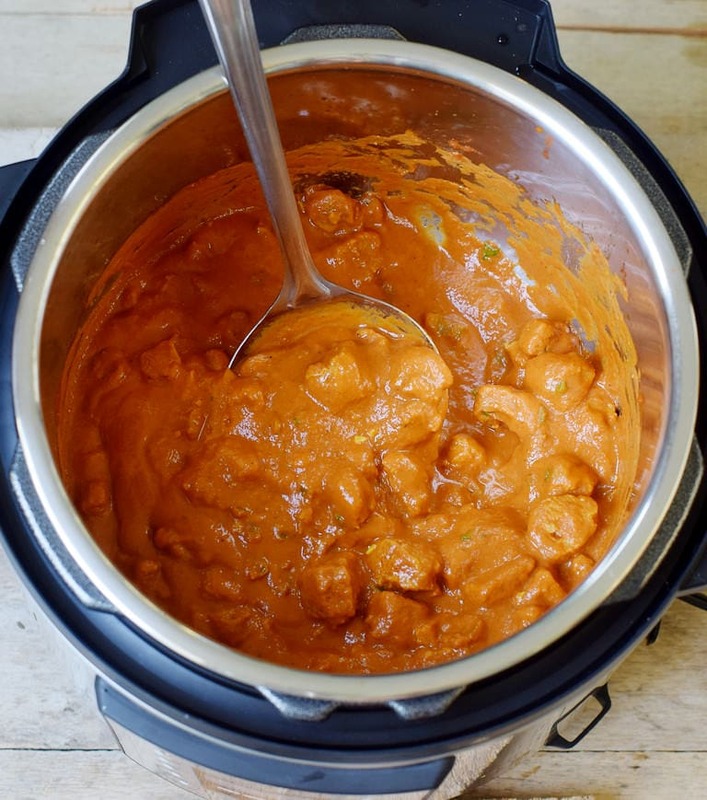 Instant Pot Vegan Butter Chicken! This is a 100% plant-based recipe without chicken and without dairy. However, it comes with lots of flavors! This chicken-free Tikka Masala will satisfy your tastebuds because the recipe is so creamy, rich, and delicious! First of all, don’t worry! My pet chicken “Erna” is doing great! This is a vegan version of my favorite comfort meal called “butter chicken”. It’s packed with so much flavor and reminds me of the good old times. My mom used to make a non-vegan version when I was little and even though I absolutely do NOT miss meat now, I missed the flavor of this curry. 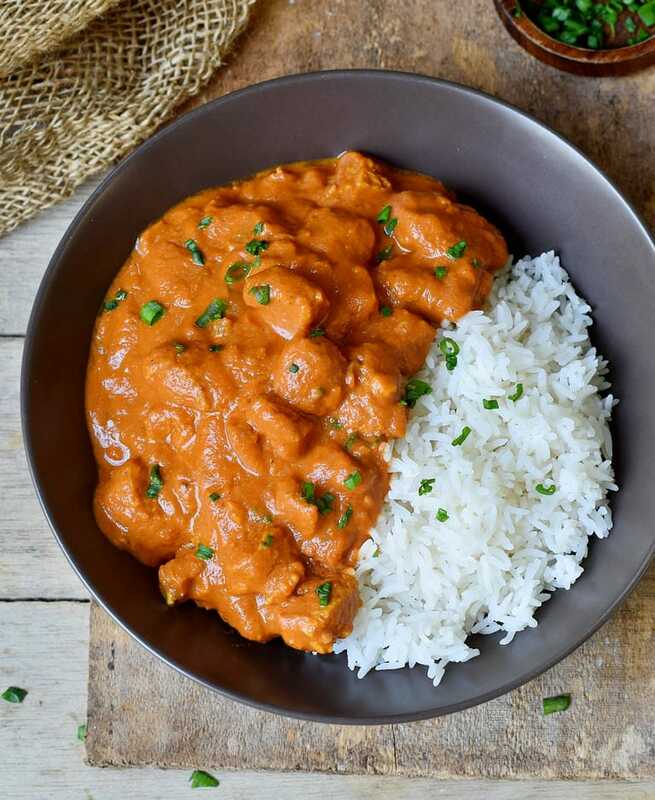 Yes, the amazing flavor which comes from the Indian spices that make this plant-based butter chicken so special. That’s why I simply had to veganize this popular Indian dish, which most people all around the world love so much. And let me tell you, it’s all about the spices. The great thing about this vegan Tikka Masala recipe is simplicity. This vegan dinner is seriously very easy to make either in an Instant Pot or on the stove. I recently received my Instant Pot and this was actually the very first recipe which I made in it. I love it and can’t wait to make more recipes in it. But don’t worry if you don’t have an Instant Pot or pressure cooker. 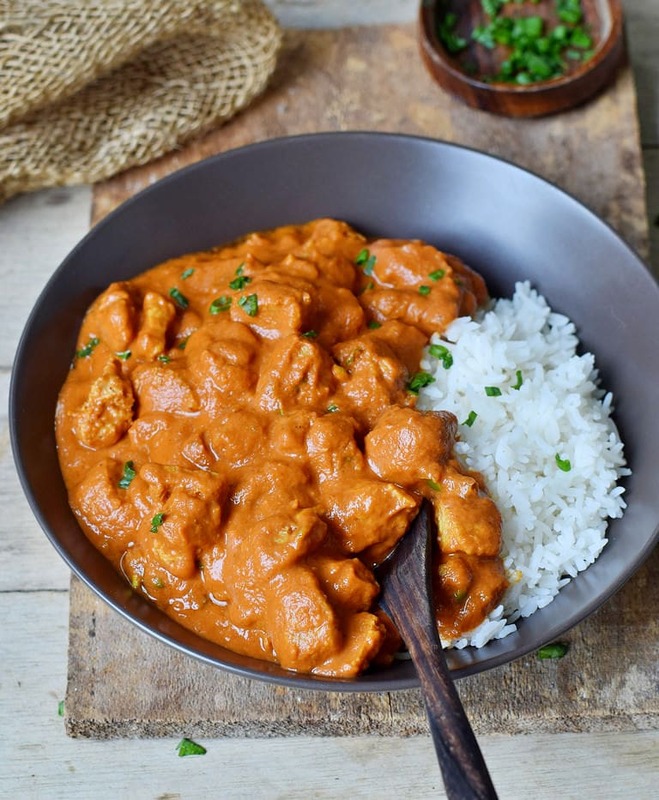 You can make this vegan butter chicken on the stove in a regular pot! I made both versions but preferred the easier Instant Pot version. How To Serve This Vegan Tikka Masala? I love to serve this vegan butter chicken with basmati rice or Yasmin rice. However, it also tastes amazing with naan bread. You can even serve this vegan Tikka Masala with potatoes or quinoa. I bet also pasta would taste amazing, hehe. Rice is probably the most common Indian side though and in my opinion also the best. But since I love the variety I am sure I will serve this meatless butter chicken also with potatoes and all the other sides I mentioned before. 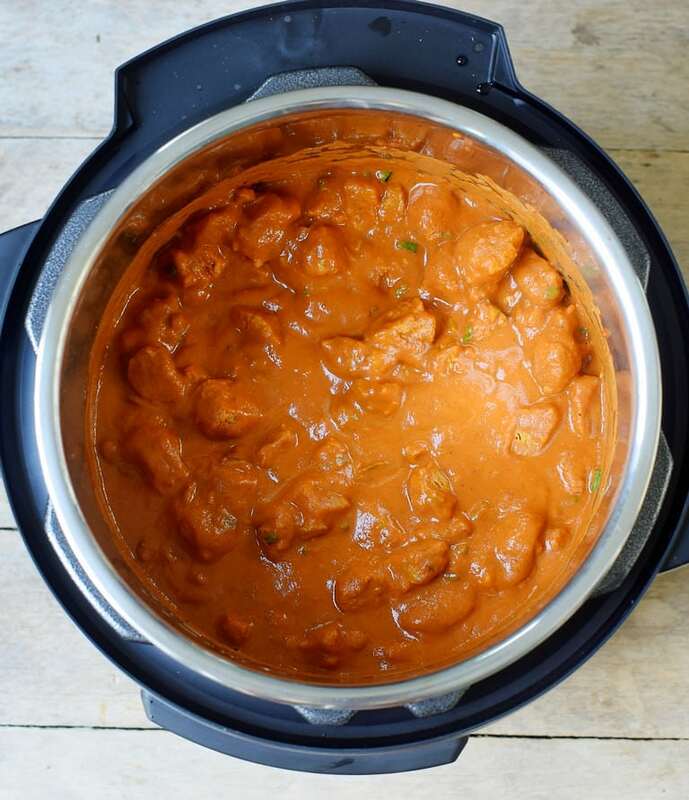 The vegan meat substitute which I used for this Instant Pot butter chicken is textured soy protein. You might have heard of “soy curls” before which are sold by a US company and made from non-GMO soybeans. The product is free of chemical pesticides, 100% natural, and contains the whole soybean. I must admit that I don’t use meat alternatives very often, just a few times per year. But these kind of meat substitutes is great for people who transition to a vegan diet and still miss the texture of meat. So in my opinion, there is nothing wrong in trying out this plant-based meat alternative. If you don’t want to or can’t use soy, don’t worry! You can use chickpeas instead! Chickpeas are another great source of plant-based protein and they taste amazing! 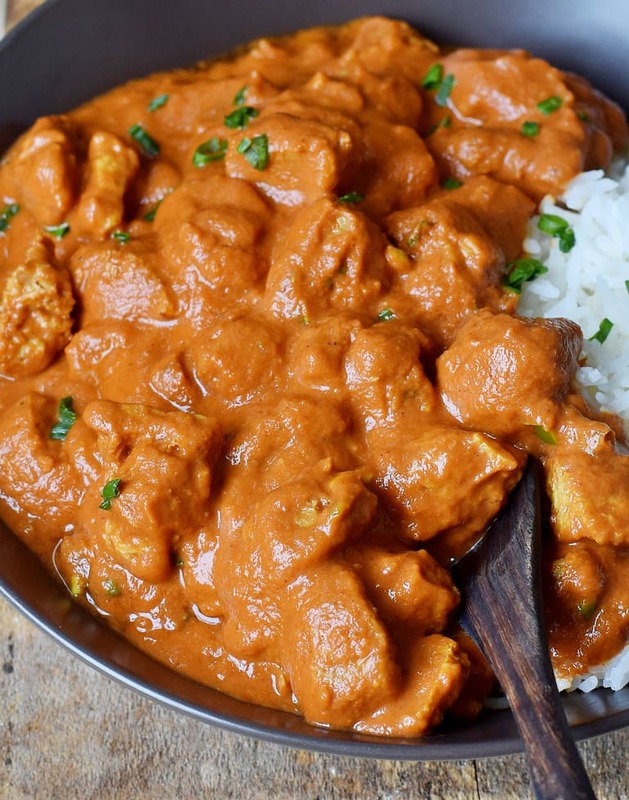 You can make this vegan butter chicken with cashew milk or any other plant-based milk. 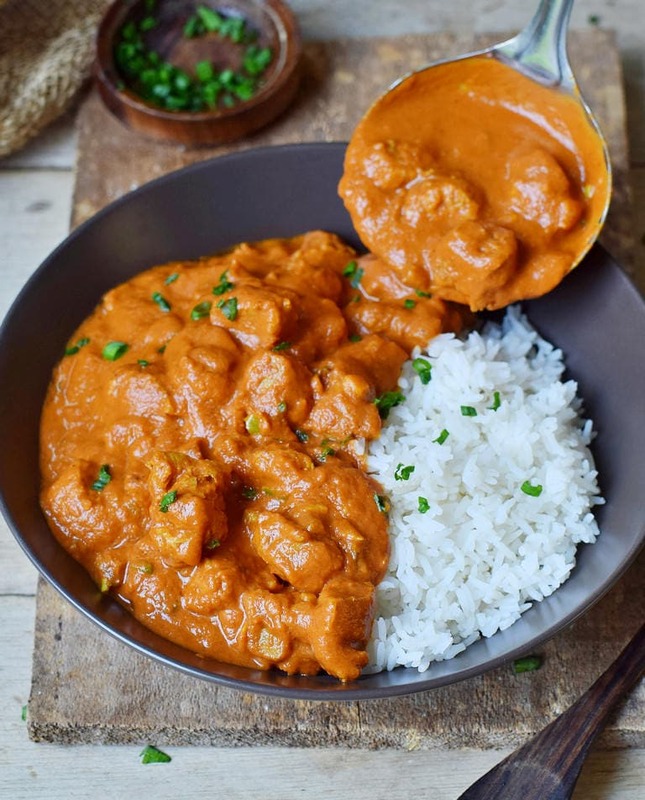 However, I recommend using canned coconut milk because the higher the fat content of the milk, the better the meat-free butter chicken sauce will taste! All remaining ingredients are spices, green pepper, vegetable broth and passata (you can use tomato sauce). 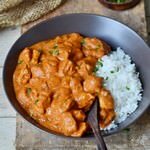 How To Make Vegan Butter Chicken? Making this vegan butter chicken recipe is easy. First, chop the bell pepper, garlic, and fresh ginger. Then measure all the remaining ingredients. It’s important that you have all ingredients readily available before you turn on the Instant Pot. Start by sautéing the fresh ginger, garlic, and bell pepper in one tbsp of oil. You can also use vegan butter if you prefer the buttery taste of the meat-free chicken sauce. Then add all spices, the passata, soy curls, and close + seal the Instant and cook on manual for 10 minutes. Quick release once the time is up, carefully open the Instant Pot, add the soy sauce, balsamic vinegar, and coconut milk. Finally, add fresh herbs of choice (cilantro or chives or even parsley) and serve this vegan Tikka Masala with your favorite rice or naan bread. You can reheat leftovers in a pot on the stove the next day or in the microwave. Leftover curry keeps well in the refrigerator (covered) for up to 3-4 days or in the freezer for a couple of months. 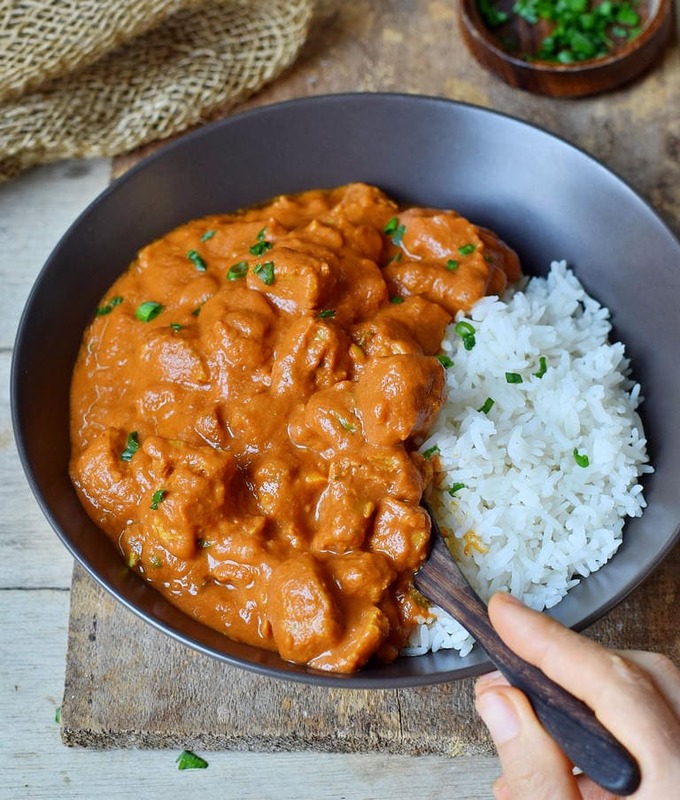 Should you recreate this meatless butter chicken recipe, please leave a comment below and don’t forget to tag me in your Instagram or Facebook post with @elavegan and #elavegan because I love to see how your vegan Tikka Masala turned out! If you want to make more vegan comfort meal recipes, definitely also check out my favorite Mushroom Stroganoff and Easy Lentil Stew! This Vegan Butter Chicken (Tikka Masala) neither contains chicken, nor butter but still tastes super delicious. The recipe is plant-based, gluten-free and easy to make in an Instant Pot (but can be also made on the stove top!). Add the oil to the Instant Pot and set to "SAUTE". Add the fresh ginger, garlic and bell pepper, and cook for about 2-3 minutes. Check the recipe notes below for the stove top version! Add all spices, sugar, the passata, broth, and textured soy protein. Close and seal the Instant Pot. Cook on "MANUAL" for 10 minutes. Once the time is up, quick release. Carefully open the lid and add the balsamic vinegar and soy sauce. Also, add coconut milk and stir. Taste and adjust seasonings. Add more salt/pepper/sugar/cayenne to taste. Serve with rice or naan bread and garnish with fresh herbs (cilantro or chives for example). Enjoy! Soak 2 cups of textured soy protein (soy curls) in a bowl with 1 1/3 cups (320 ml) of hot vegetable broth and set aside for 10 minutes. The soy curls will begin to fluff and absorb all the liquid. Heat the oil in a pot over medium heat, add the fresh ginger, garlic, and bell pepper and cook for about 2-3 minutes. Add all spices, sugar, the passata, and the soaked textured soy protein. Cook on medium heat for about 10 minutes. Add the balsamic vinegar and soy sauce. Also, add the coconut milk and stir. Follow the remaining steps of the recipe. You can use cashew milk (or preferably cashew cream) instead of canned coconut milk. I wouldn't recommend any boxed plant-based milk with a high water content though. You could use two 15 oz cans of chickpeas (rinsed and drained) instead of the textured soy protein (soy curls). I haven't tried out this version yet, but I would recommend using just 2 1/2 cups of tomato sauce/passata. Cook on "MANUAL" for 10 minutes, then quick release. The recipe serves 4. Nutrition Facts are for one serving (with canned coconut milk). If you use boxed coconut milk the calories are 250 kcal, 11 g fat, 15.3 g carbs and 17 g protein per serving! Hi! Could you also add pictures of the soy curles throughout the process? It would help find them in the store. If it is what I think (the round ball-shaped ones, the size of an olive before cooking) – they were very soggy when I used them last time. Do you have any tips for that? Would using a pressure cooker help with this problem? I just love the sound and look of this curry Ela! Such a delicious idea for dinner! Wow this looks great! Do you think it would work with Quorn nuggets as a substitute for the soy culs? Delicious recipe, Ela!! My family and I loved it! I used quorn nuggets and did pressure cooker mode for 5 mins. What a HIT! Okay talk about a thick curry! This is stunning, Ela! And that color is just so rich! I made this last night and it was so delicious! I’ve never had a recipe turn out so well, even when I made modifications! I used the stove top method and used chickpeas instead and it was so good! Even the meat eater in the family loved it! Yay! I didn’t realize you had an instant pot! Now you’ll be able to try the recipes in my cookbook 🙂 and this sounds so incredibly indulgent and delicious! It’s such a better cruelty free alternative to the traditional recipe! Omg made this yesterday with my boyfriend, is whole family loved it! I don’t usually like butter chicken butter chicken but this was amazing! Hi Gia, I am so glad you all loved the recipe! I would happily eat this every single night 😀 absolutely delicious! It was my first time trying my instant pot too so thank you for the clear instructions. Hi there! This looks absolutely amazing and I can’t wait to make it! When you list “green pepper”? do you mean bell pepper or am I way off? I was just introduced to your site and can’t wait to try this and other recipes. In my 5 years of being vegan and cooking my way through all sorts of recipes yours are the most tasty, simple and affordable I’ve ever come across. Every night we’re blown away and licking our bowls clean. I’ve told my partner we’re putting down our cook books and just cooking our way through your website from now on. It’s all too good to be true. Thankyou Ela, we’re a very happy and satisfied household! Wow! Thank you so much for your amazing feedback, Ellie! It makes me so happy that you like my recipes. I couldn’t upload a picture but this curry is amazing I am so surprised and it tastes restaurant quality. I can’t believe I cooked it. This is a brilliant recipe. Do you soak the soy curls in the water first? Or do you just add the water (Vegetable stock) to the instant pot? Made this last night & I think I added to much water but it was still incredible. I’ve been looking for a vegan butter chicken recipe & yours is definitely the best one. No soaking if you make the recipe in an Instant Pot. If you make it on the stovetop you need to soak the soy curls. This looks amazing! I’m so excited to try it! Do you know if it’s possible to use tofu instead of soy curls and the method one would go through using tofu? Thanks!